CHILDREN at the Whiteness Primary School were learning about the emergency services during a special visit earlier this week. The police and the fire service attended the school to teach the kids about the work they do and how they can be contacted in an emergency. The children also learned about the various equipment the services use. The event was organised by police constable John Paul McAllister and watch manager Ewan Anderson, with PC Catherine Hannah and fire fighter Kevin Odie also assisting. 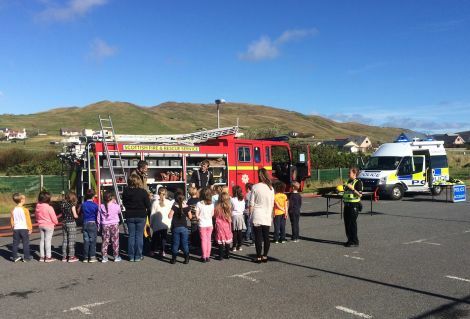 “The day consisted of the children learning about the different kinds of situations people within the community may need to rely on the emergency services, and educating the children on how to contact them through the 999 system,” McAllister said.